An impressive Vauxhall glass guard chain that was made around 1870 when black was very much in fashion due to Queen Victoria’s husband Prince Albert’s death. 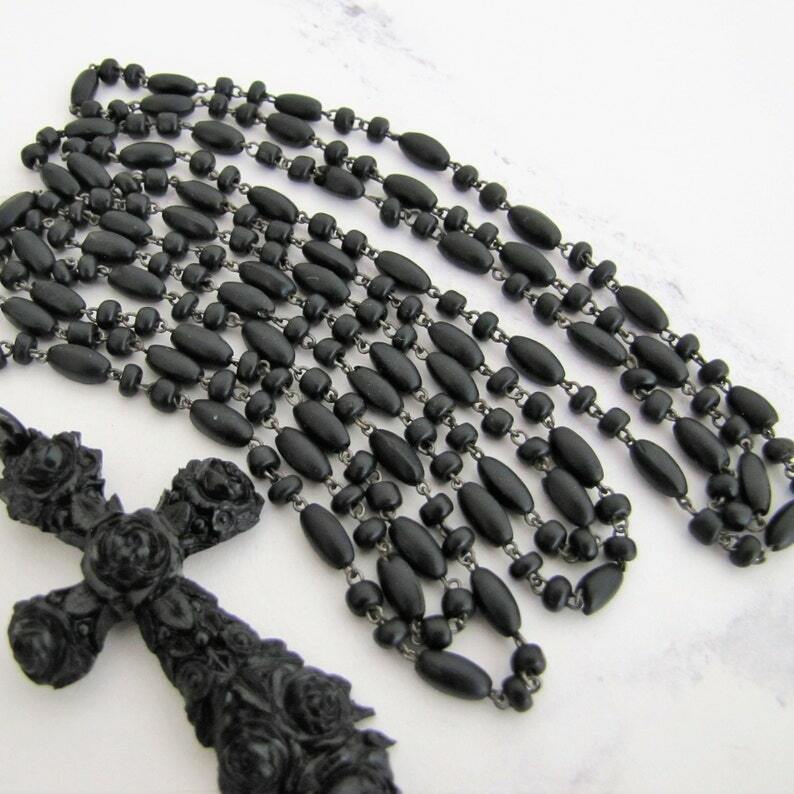 The black glass beads have a matte or bloomed finish which signifies that the original owner was in a stage of deep mourning, shiny black was only deemed socially acceptable for the latter stages. Vauxhall glass is often called French jet which is somewhat confusing, it is tougher than jet and equally appealing when worn. Vauxhall glass jewelry was manufactured in London factories during the 18th and 19th centuries. This attractive guard chain is composed of oval and barrel shaped black glass beads, it is 58 inches (approx. 148 cm) long and terminates in a black lacquered dog clip. During Georgian and Victorian times these "guard" necklaces were worn with crosses as shown as well as lockets and pendants. They were often one of several jewels worn at the same time and were also used to attach and keep close to hand all manner of useful things like pocket watches. Condition of the necklace is very very good with only occasional tiny chipping to some of the beads apparent only under magnification. Fine quality and heavy for size it drapes well with no kinking. This necklace has stood the test of time for 150 years and is destined to last many more moons to come. Please note the black Vulcanite cross is not included but is available for purchase separately.